Hellllloooooo Friends! We are back from the beach (post coming soon! ), and trying to get back into the swing of things since we only have A WEEK AND A HALF of summer left!!! Brantley and Grayson start 2nd grade and Kindergarten (WHAAAAAAT) a week from Wednesday, so we have 9 days to cram in the last bits of summer fun and back to school prep that we can! And also a bit of down/relaxation time, since their little worlds are about to be rocked with school all day long and cheerleading twice a week! 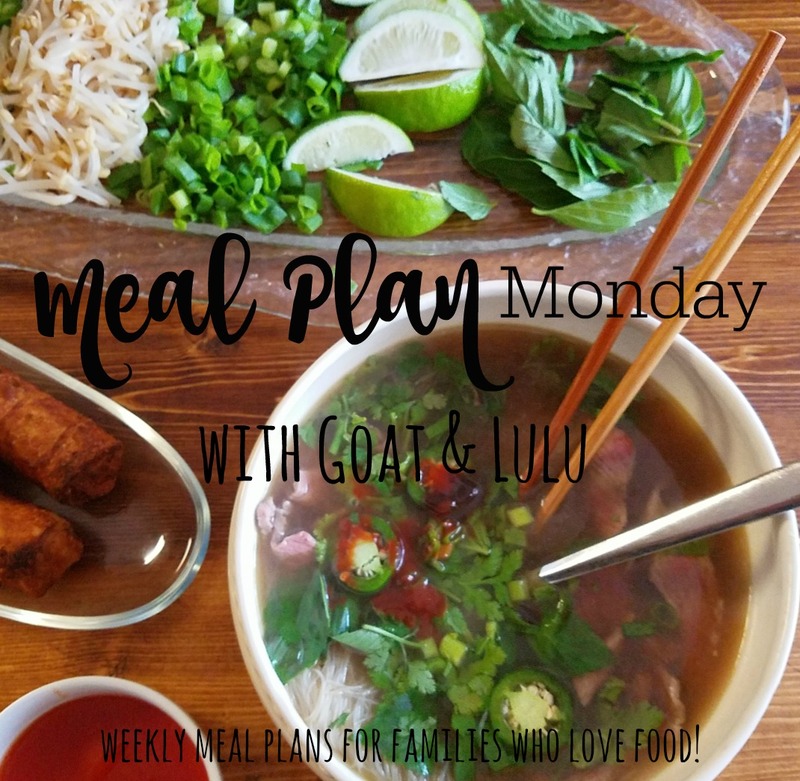 SOOO…I am kickstarting my meal planning again this week to get back into the groove since the next few weeks will be super busy and having dinners all planned out will be my saving grace. I have been stockpiling easy, healthy recipes and will be sharing lots of easy no-brainer dinners to keep in your back pocket, as well as my meal plans so you too can be prepared for back to school! 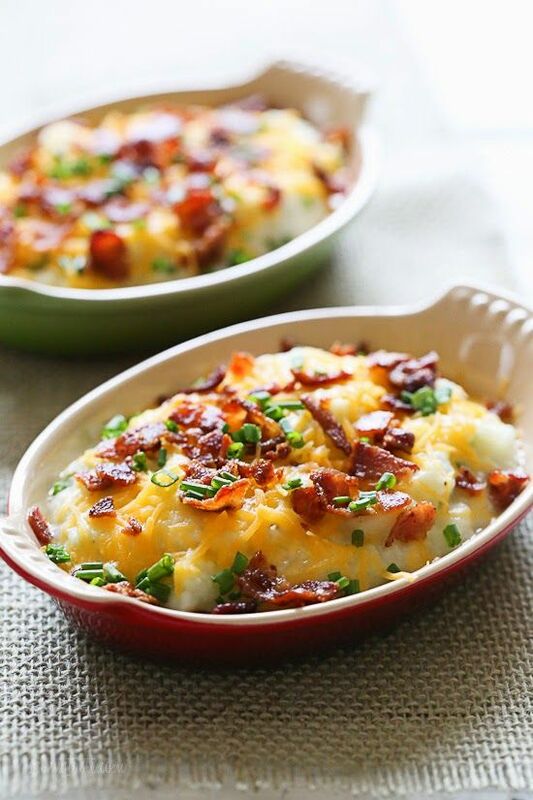 I have been making a lot of recipes lately from SkinnyTaste, and when I saw this one for a loaded cauliflower bake, I thought it would be worth a shot. I keep trying and trying cauliflower side dishes, but have found so many to be bland and boring. But I actually made this last night, and it wasn’t so bad! Next time I’ll add a bit more salt, but it was definitely a good sub for mashed potatoes. And with two of our favorites- ham steak and green beans (tip- if you use canned green beans, use two cans, drain out the canning liquid and substitute one can’s worth of water, and add two chicken bouillon cubes and simmer for at least 30 minutes for much better tasting canned green beans! ), it made for a tasty and healthy meal! I think I am most excited about this recipe! I am anticipating lots of slow cooker meals like this in the upcoming weeks, since we’ll have more activities on weeknights and less time for cooking-intensive dinners. Scott and I love Vietnamese flavors of Pho and Bahn Mi Sandwiches, and with this dinner we are just subbing the bread for some healthier brown rice, but keeping the sweet, sour, and spicy flavors that we love so much. 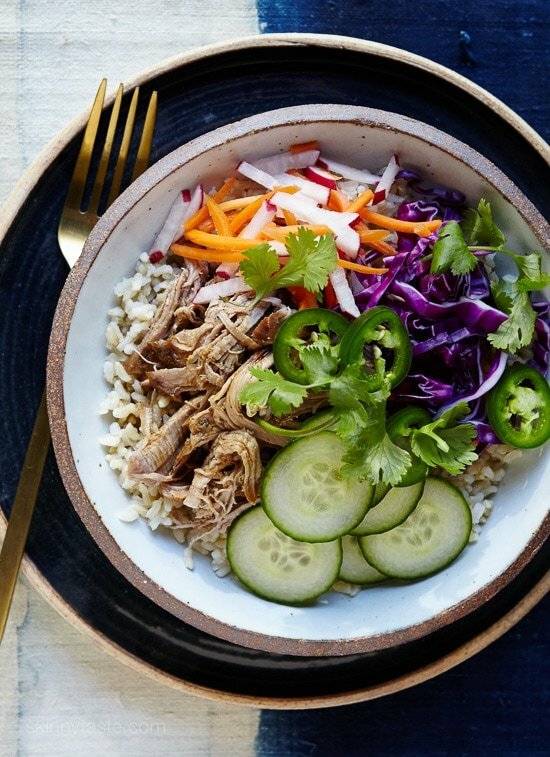 Plus, I am kind of obsessed with rice bowls. They are so easy to make for a dinner- a protein, some rice/quinoa/noodles, and a bunch of veggies. The kids love them too, since they get to pick whatever “toppings” they want. Win-win! 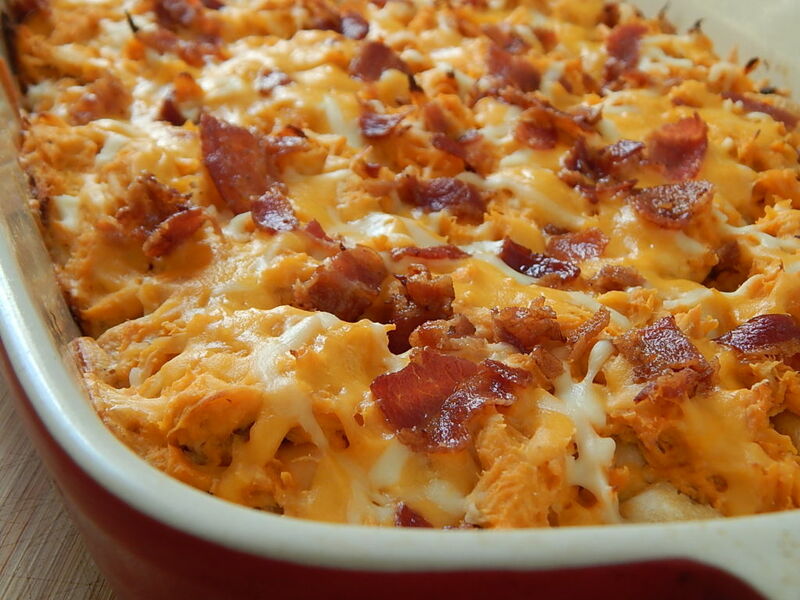 Buffalo chicken, bacon, and BISCUITS? What could be better?! Throw in a side of steamed broccoli, and I am pretty confident that this will be a winner. Or should I say, a winner, winner, buffalo chicken dinner?? OHHHH-KAY…enough of that. I am all about a good casserole, and if I pre-cook the chicken earlier in the day, it will make dinner prep a snap. Comfort food without the guilt! 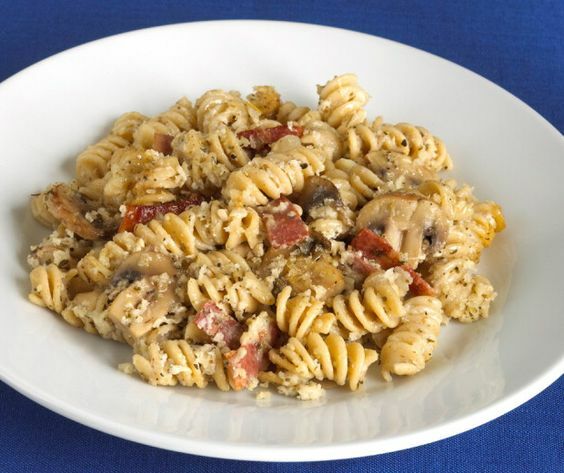 I love that this is actually a heart healthy recipe, and with some roasted asparagus on the side, it’ll satisfy my pasta craving without being too bad! Next to the Bahn Mi Bowls, this is the other dinner I am most looking forward to! 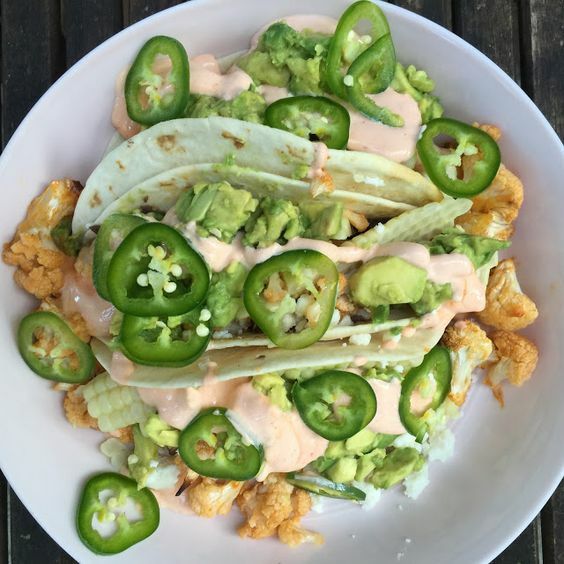 I had seen this recipe on Buzzfeed, but was just too hesitant to try cauliflower tacos…but after I saw it again on one of my favorite blogs, and she made it and said they were amazing, I have been so anxious to try them! You roast the cauliflower in a little butter, hot sauce, garlic salt, salt and pepper, and then load the tortillas with refried black beans, corn, avocado, queso fresco, sour cream, more hot sauce, and jalapenos. I am planning on making quesadillas for the kids, since I’m pretty sure the hot sauce and jalapenos would be way too spicy for them, but I am SOOOO excited about these tacos for me and Scott! That’s all I have planned for us this week for dinners. What are you making? I love new ideas and new recipe recommendations!